SM Electrical Solutions are professional electricians serving Hyde, Manchester, Stockport and High Peak from our base in Glossop. We offer a full range of electricians’ services, carry out electrical contract work for business and are fully qualified Part P electricians so can carry out domestic work. From full rewires to fitting a few extra sockets in your home or office, we can also install and repair the electrical circuits associated with showers, cookers, central heating systems & alarm systems. Much of the work we do is for domestic customers but we also carry out commercial work in offices and shops. We are fully qualified, competent and insured to carry out electrical work in compliance with all the relevant regulations. We provide high quality work, using good quality branded materials that will stand the test of time. We guarantee all of our workmanship for two years and all the materials we use come with a manufacturer’s warranty. We have been working in Glossop for several years and have lots of local customers happy to recommend us should you require a reference. You can also see some testimonials on this site and further reviews on other websites. As a local business, which relies heavily on recommendations from happy customers, we always do our utmost to ensure all our customers are 100% happy with our work. With a wealth of valuable experience as fully qualified and competent electricians, you’ll receive a very high standard of workmanship and customer service from us. We do our best to ensure our work is carried out with as little disruption as possible and always clean up when we finish. In the unlikely event there are any problems with any work we have done, we’re just a phone call away and will be happy to come and resolve any issues you are having. As well as domestic work for private individuals we can also carry out commercial jobs including electrical work in shops and offices. We also often work on projects in conjunction with other local tradesmen. If you’re a builder, joiner or other tradesman who wants an electrician to work with you from time to time, we will be happy to hear from you. We also carry out work for landlords and letting agents, and are able to carry out the electrical testing required when renting, buying or selling a property. 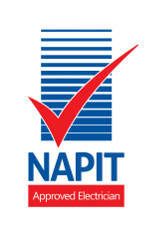 As an NAPIT Approved Contractor we work in conjunction with the local council’s Building Control Service and thus ensure all the work we carry out is compliant with all relevant regulations. All work is Inspected and Tested and relevant certification provided in Digital and hardcopy formats. Get in touch now so we can answer any questions you have, we don’t charge call out fees so depending on the work involved, we often come out to see you for free so that we can provide you with a no obligation quote. Why not click on the following links for more information on the latest electrical regulations and electrical safety in your home.